14. Palm Pre (smartphone, $150 with two-year Sprint contract) The Pre wowed us with its engaging (and fun to use) WebOS software and eye-catching hardware. Thanks to the Pre’s responsive multitouch screen, its intuitive gesture-based controls, and WebOS’s beautiful way of organizing information, this smartphone is a pleasure to use. The keyboard may not be perfect, but that’s a minor trade-off for everything else the Pre offers. JK On The Run reports that the Palm Pre catalog has hit 300 apps. For those keeping score in the mobile software wars, it’s roughly 100,000 to 10,000 to 300. That’s the number of available apps for iPhone, Android, and webOS devices, respectively. Although the number of apps for Palm is relatively much smaller, it is growing at a decent clip now. Apple likes to keep its popular products within tight cages where it stands to maximize its revenue and profits. Unfortunately, they keep slipping out. From Psystar unleashing super-simple software support for creating Snow Leopard Hackintoshes, to the iPhone unlockers, Apple’s products frequently have been getting unlocked and freed of restrictions. And most offensive of all to Apple is Palm’s Pre smart phone that has been tweaked to work with iTunes, thanks undoubtedly in part to new CEO Jon Rubinstein’s intimate knowledge of the iPod hardware and software (he was a former Apple executive). When the Pre came out, Apple quickly moved to kill the feature, about a month after the phone was released. An iTunes update temporarily killed the functionality… until about 9 days later when a Pre firmware update restored it. Much like Apple’s “cat and mouse” game with the iPhone unlockers, Apple keeps at it, though, trying to lock out its rival. ITunes 9.0.2, released Thursday brings support for the 3.0 firmware of Apple’s set-top box, Apple TV. More importantly, it locks out the Pre, yet again. While iTunes will still launch when you connect your Pre (apparently partially connecting to the program) the Pre won’t show up in the side bar, and songs won’t transfer. The Pixi has an ARM processor instead of the state of the art TI OMAP processor that the Pre (and the new Verizon Droid) uses. It’s a good processor but it is slower. The Pixi does NOT support wifi. This is a biggie. Especially for those of you that are in fringe coverage areas. With WIFI, you get lighting data performance and coverage in areas that the carrier may not support. To support the size, the screen is about 20% shorter, It has the same aspect ratio so the text will be the same size, but you can’t see as much at the same time. For most operations this should be OK unless you are watching alot of Video where the picture will have to shrink to show the whole frame. This however, is one nice thing about the WebOS design versus a fixed resolution design like the iPhone. A variety of size and form factors can come out and all the software should automatically support it since the rendering engine allows for variable window sizes and resolutions. Can Palm and WebOS make it through 2010? The Palm Pre is a decent device that I did enjoy using for the most part. However, the quality was sub-par compared to the devices available from other manufacturers. The Pixi is coming soon to join the Pre on Sprint, but we don’t see people flocking to Sprint just to get the Pre like we do with AT&T and the iPhone. The most exciting smartphone platform at the moment is Google Android and they now have or soon will have devices on T-Mobile, Sprint, and Verizon. In my opinion, the HTC Hero on Sprint is a more compelling device than the Palm Pre on the same carrier due to its rock solid hardware, availability of thousands of applications, and user experiences that match and even exceed what we see on the Palm Pre. There have been no announcements of any WebOS devices coming out on other carriers, with rumors that Verizon may get the Palm Pre in 2010. Unless a new Palm Pre model is brought to Verizon it will be a year old device that may be a tough sell with some very compelling and powerful Google Android devices available soon on Verizon. I personally do not have a lot of confidence in Palm getting past 2010 without rolling out updated WebOS devices on other carriers. Do you think Palm can continue and succeed with the WebOS? Droid on Verizon to make things tough on Pre next year? the Pre will hit Verizon in ‘early 2010′ – but it’s going to be landing amidst a much more crowded field. The Pre will be up again the Droid, the Eris, and the Storm2. Had Palm not stuck with Sprint for so long, they could have had a window where the Pre would have have had a legitimate claim to be the solitary flagship device on big V.
Checkout Pre Central for their survey on this. BillShrink have made the process of selecting a phone a little easier by providing a nice infographic with the latest smartphones. They offer a free personalized cost-saving service designed to help people lower their spending by monitoring over 10 million wireless plans. BillShrink has launched the first-ever handset selector interactive feature that let’s you search by features and then matches you to the best phone and plan. 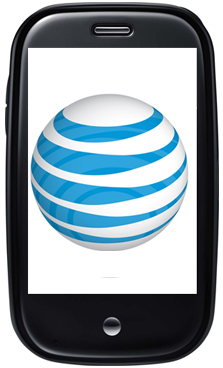 According to the a tipster over at Precentral, Palm showed off a GSM Palm Pre working on AT&T’s 3G network. There’s a chance AT&T might pick up the Palm Pre before Verizon. Verizon has been rumored to get the Pre since before the Pre’s release date mainly due to the Verizon CEO saying they will be selling phones like the Storm 2 and the Palm Pre by the end of the year. Ralph Del La Vega, AT&T’s CEO, then followed up the very next day saying, AT&T will be carrying the Palm Pre by the end of the year. So we have both carriers lusting for this new device. 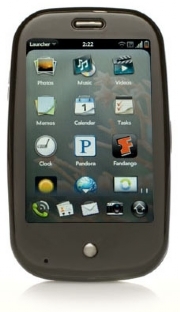 Then as time goes on the rumors for Verizon fly as we hear more and more about them possibly getting the Palm Pre. At first it made the most sense that the Pre would end up on Verizon. Reason? Verizon is a CDMA network exactly like Sprint, Verizon is known for its lack of quality smartphones, and because AT&T already has the iPhone. What we didn’t think about is the fact that Verizon could be working with Google and may be perfectly happy with an Android offering. Verizon and Google announced their partnership and how they were going to focus on putting out great Android devices with an open take on things (see Verizon Droid). Then we have AT&T. AT&T is hanging on to iPhone exclusivity by a thread. The GSM carrier is rumored to lose exclusivity in the coming months, making the Palm Pre the perfect rebound device for them. We saw screenshots of the rumored EOS before the Pixi was announced on an AT&T advertising pane, we have Verizon rumored to get it in the first quarter of 2010, and now we have rumors of AT&T possibly getting the Pre in January, which could mean a U.S. GSM Version before Verizon’s version. No matter how you look at it, it seems like the Palm Pre is still a phone worth having a rumor fight over. So whether it is Verizon or AT&T who gets it, lets just hope it happens fast. A recent survey shows that while Research In Motion continues to lead as the smartphone of choice among consumers, that Apple’s iPhone is quickly catching up. ChangeWave Research on Tuesday released the results of its week-long September survey of 4,255 consumers, which showed that RIM retains its lead in smartphone ownership with 40 percent market share. That’s actually a dip of 1 percentage point since the last survey in June, and the lowest share RIM has registered in two years. 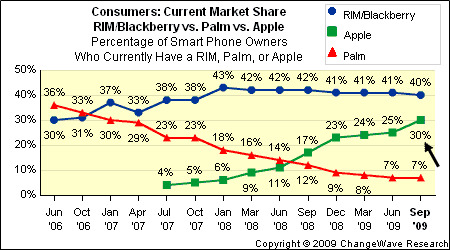 Despite having more models of smartphones, RIM is facing serious competition from Apple, whose iPhone has 30 percent market share among those surveyed. That’s an increase of 5 percentage points since June, when the new iPhone 3GS was released. Among the same group, Palm has maintained a 7 percent share since June. Though it didn’t see any growth even with the introduction of the Palm Pre and more recently the Pixi, the two new WebOS-based phones are helping the company to not lose share. Palm has seen its market share of smartphone ownership erode steadily from its peak of 36 percent in June 2006. Read the full story at Cnet.